Please indicate on the registration form if you need to use one of the 4 laptops available through Encore. Computer classes having less than 5 participants will be cancelled. Register early. “DIY – Can You Really Do IT Yourself” with Jack Snoeks (April23, 30, May 7) has been cancelled. April Ann Campeau’s “Best Foot Forward” has been rescheduled to Friday, April 26 at 10:00am. on Thursday, Apr. 18 has been cancelled. All Tuesday, Feb 12th courses are to be re-scheduled. Participants will be notified by the course host of new dates & times. Rescheduling of WRITER’S WORKSHOP with Lesley Orr. members the opportunity to learn and practice new skills or hone old ones. more ways to get the most out of your iPad. Please bring your Apple iPad to class. back pain. She will also have copies of her books available for sale. you have a laptop, please bring it, as Encore has only a few for classes. would venture to such a cold and desolate location as Antarctica. 27; Apr 3, 10, 17.
you in a project of your choice. Let the chips fall where they may! too, can complete a kit to decorate your home or use as a beautiful Christmas gift. provided. If you have a laptop, please bring it, as Encore has only a few. you at Glengarry Encore. Over 300 people attended a first showing in October. You certainly do not want to miss this outstanding collection. mind works with memories and guide you to create your own happy journal. Linda’s work on her website at www.emotions360.com. graduated from the National Institute of Genealogy Studies, U of T.
realist, it could be stories of the clearances and decline of Gaelic culture. interesting and entertaining series of classes. TIME: 10:00 – 12:00 p.m.
Design, will take you through the fundamental steps of this writing technique. more information on what Anick does so beautifully: https://leftnwrite.com. challenges such as memory loss, anxiety, depression and obesity. more about this alternative therapy. offer guidance, even if you’ve never touched a brush! Please ask for the supply list at Registration. changes in kidney functioning for dialysis patients. a comprehensive list of native medicinal plants in Eastern Ontario. used her skills to help those with untreated hearing loss and deafness. The ever-changing landscape of life poses an ongoing challenge for everyone. resilient when changes, especially those we cannot predict or control, happen. health, having a roadmap for not just surviving but thriving in times of change. learn more about Betty Healy by going to her website at www.roadsigns.ca. art as therapy and then have fun learning to create a mandala. learn this unique way to make beautiful greeting cards and embellishments. diaphragm of a camera lens. wool, silk and cotton for sale, along with goat milk soap and other delights. detailed material that should be referred to a lawyer. three courts at their home. Enjoy exercise, fun, and certainly some laughs. butterfly – our brand logo! appetizers while YOU work. Bring your apron and your appetite! beer (at your own expense). and 20 of phlox, these amazing gardens are worth the trip to North Lancaster. Traditional Ecological Knowledge – April 16, 2019 This session was hijacked!!! Now that we have your attention we will share a part of a very..
⚒Course Cancellation⚒ “DIY – Can You Really Do IT Yourself” with Jack Snoeks (April23, 30, May 7) has been cancelled. Unfortunately “FRIENDS INTERNATIONAL: Making a Difference” with Linda Cull on Thursday, Apr. 18 has been cancelled. 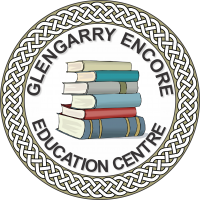 © 2018 Glengarry Encore Education Centre. All Rights Reserved.